CMS Hasche Sigle is one of Germany’s leading commercial law firms. Our clients benefit from an individual, comprehensive and in-depth service across all areas of German and international commercial law. More than 600 lawyers, tax advisers and notaries support German and international companies across a wide range of different industries, from successful SMEs to global corporations. We advise national and international clients from many sectors, including industry, commerce and service providers, as well as public institutions. CMS Hasche Sigle has offices in 8 key German business locations. Our strong local roots in Germany – our core market – are backed by close relationships with foreign law firms in the international CMS organisation. As a result, we offer our clients access to a specialist network combining local knowledge with the capacity to act throughout Europe. 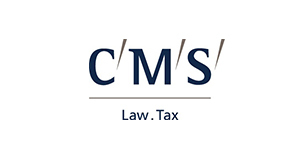 CMS Hasche Sigle is a member of CMS, which provides clients with specialist, business-focused advice in law and tax matters. Our 3,000 legal professionals across the world, working in sector-based teams and trained in project management, are focused on our clients and fulfilling their objectives. CMS lawyers operate in 59 offices worldwide, offering real-world advice to clients operating in a challenging business climate and a fast-changing regulatory environment.